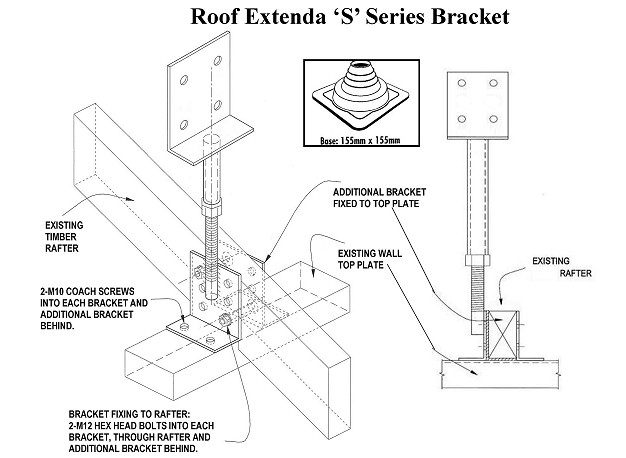 Note: prior to erecting a pergola or carport using the RoofExtenda Brackets check if a building approval from the Local Council or Shire is required as regulations vary from area to area. Remove roofing tiles or lift roof sheets to achieve an opening to fit the Roof Extenda. Bolt angle bracket with the threaded rod and backing plate to the selected rafter with 2-M12 bolts. Provision has been made to fix the angle sections to the existing wall plate using 2-MIO Coach Screws to eliminate any uplift. Replace roof tiles or roof sheet cutting the hole to allow the threaded rod to penetrate the roof. The Weather Seal is fitted to the top bracket.top bracket is then wound down to the desired height and the lock nut tightened. Mark the position of the Weather Seal on the roofing. Slide the Weather Seal up to apply clear neutral cure silicone to the area marked, press the Weather Seal into position and finish with a bead of silicone to the edges of the Weather Seal to complete the fitting.